Let’s narrow it down and ask the question: what is the long-term outlook for our local communities and residential traffic? While the local advertising agency may be getting the big bucks to promote car sales, who is regulating the use of urban and neighborhood road development? Who is keeping up with road repair and general infrastructure to keep our highways and localities safe and road worthy?The answer is, you and me. Yes, it falls on each one of us to let our representatives hear our voices. We all complain to one another when we must dodge potholes on every block. We all throw a fit if a red light stalls us for a full 3 minutes. We find a problem with too many trees blocking visibility and we are most aware, as the end users, if an intersection is unsafe. We, as the people have the power and must act with a loud voice when a situation is disrupting or preventing the overall safety of an area. These are important to a well-run, road system along with the overall view of livability. Urban developers want a feeling of warmth, charm and safety. Not just safety alone. Developers want to give streets personality where pedestrians interact and feel good about walking as well as driving. We naturally and automatically judge an area by its outer appearance. If a community’s landscape is clean and green the visual quality relays to higher investment and lower crime. We tend to think more highly of streets that have vegetation lined curb. Nature has a subliminal, as well as a conscious effect on why people want to live and do business in an area creating a positive community character. 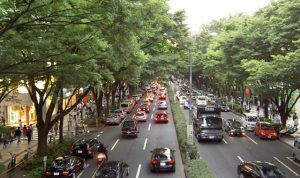 Studies are showing that trees may improve driving safety. Landscaping apparently makes drivers more conscious of their surroundings. Statistically, it’s been noted that there has been a 46% reduction of vehicular incidents along urban and highway roadways that have landscaping. This includes a 5%-20% decrease in mid-block crashes. A good portion of the working public commute to and from work or within their job descriptions. Greenery and well managed traffic flow, street upkeep and repair all contribute to a less stressful drive. Drives which involve industrial areas or building lined streets void of greenery tend to add to a driver’s stress. According to recent studies, potholes, and the unavoidable foibles that come up when spending a good deal of time in a vehicle are more annoying and frustrating. It’s not surprising that most people resonate with an appearance of a healthy environment. Even when it is not registering on a conscious level, the subliminal effect of good traffic and road management is huge in our daily lives. What's Going On With Electric and Hybrid Cars?